The demonstration of the VHD (Video High Density) interactive videodisc system by JVC at the 1984 Nebraska Symposium attracted a lot of attention. Will it split the marketplace? Is the technology really valid for the 1980s? Mystery Disc, is possibly more interactive than the Mystery Disc. It contains a full diagnostic flow to identify and rectify faults, and for sheer volume would also be hard to beat. The pre-master tapes for the two sides total 111 minutes running time; there are more than eighty separate vision modules, nearly all with dual audio, and over 400 separate still captions. Despite its decision not to go for the big market, THORN EMI did keep together the key members of its software team, and it also kept open, on a care and maintenance basis, its disc pressing plant in Swindon, England. The slim team began to investigate the potential for the industrial and educational markets in the United Kingdom. Some innovative development work was completed, at both Level 1 and Level 3. One disc in particular, made jointly with BL Systems (the computing division of British Leyland-the United Kingdom's only major domestic motor manufacturer) aroused a lot of interest. But for the THORN EMI team real frustration came when a venture with a publisher, successfully piloted on VHD, was developed into a user system by the publisher using LaserVision disc players because VHD was not yet available on the market. The final decision to launch VHD in the United Kingdom came in November 1983, almost exactly a year after some eighty members of the original VHD were sacked or redeployed. The team was re-structured with a sales and marketing manager recruited from Philips Laser-vision, a technical support team brought in to supplement the programme-making skills, and the disc factory was re-staffed. It was the first serious attempt in Europe to hit the market in a structured way. THORN EMI is one of the largest United Kingdom companies, and is now an acknowledged leader in information technology products, both hardware and software. It has a strong industrial base in white goods, television manufacture, and the defense in-dustry. THORN EMI also has good cash flow from interests in television rental (another uniquely British business). It presents a very sound base from which to launch a complementary product like videodisc. The main product in the range is the JVC-built disc player deck-a sophisticated Level I machine on its own. There is a range of United Kingdom built computer interfaces and man/machine interfaces available, some offering text and graphic overlay. A disc program dump into an 'intelligent' control key-pad is in development. Two interface units are available: the standard IF100 Serial Interface, and the IF200 which has all the technical features of the IF100 plus teletext-style text and graphics synchronized to the video signal. There was understandably some skepticism from industry watchers in the United Kingdom when the launch was announced, especially as the interactive market in the United Kingdom was still embryonic. After nearly a year it is fair to say that THORN EMI and VHD have actually pushed the market on. The only big selling videodisc jukebox in the United Kingdom uses VHD, and the first big dealer network for a motor manufacturer (Austin Rover-part of British Leyland) has gone to VHD. THORN EMI offers a "within the week" turnaround on discs and with volume has delivered faster. Compare that with Philips' average four weeks turnaround time from Eindhoven, Holland. The projection was that there would be more VHD players in serious use, as against developmental use, in the United Kingdom by the end of 1984. This was largely because the market had seen VHD offering a fast response service-almost competitive with the videocassette. Many of those users would not have bought the more costly, slower turn-around laser system. VHD's presence is putting pressure on the laser companies to get their marketing departments moving. The loss of the Austin Rover network (which they had seriously expected to get in 1985) was undoubtedly a blow. Whether VHD can maintain this impetus as other big communications networks are commissioned we have yet to see. IBM has gone with Philips, one of the big banks will certainly be using LaserVision, and one major retail chain is using Philips equipment for point-of-sale. What VHD has shown the other manufacturers is that the market is not interested in technology for technology's sake. Philips has launched a low cost industrial laser player, they are speeding up disc pressing times, and have dramatically strengthened their market support team. Pioneer is entering the market in 1985, and is already actively seeking small 'seed' jobs, one prominent job being for Vauxhall, the United Kingdom division of General Motors. VHD does have unanswered questions in its capacity as a system. It has severe limitations as a still picture database. Because it is a contact system, the sensor has to lift from the disc to search, and it will always be a bit slower than laser systems (worst case at present is five seconds). Disc life in continuous use (as in point-of-sale) is another major consideration, and THORN EMI has recognized this by reducing the cost of re-pressing once a disc master exists. 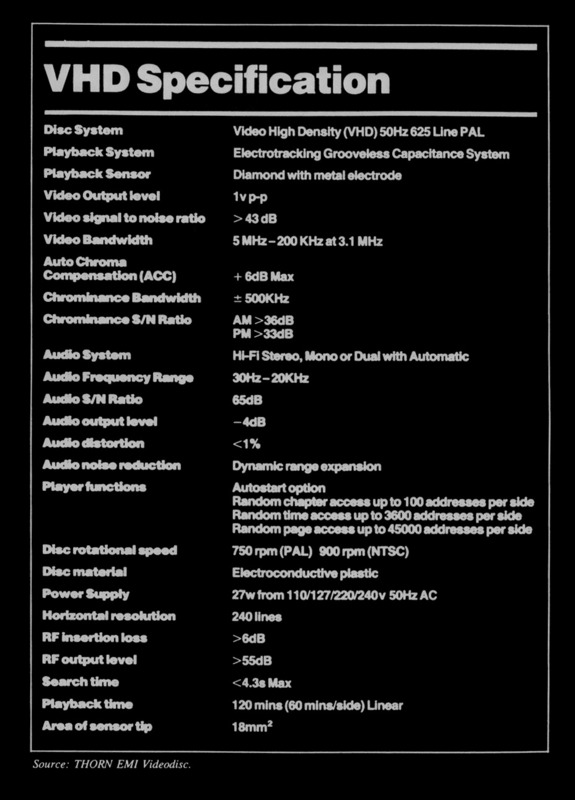 THORN EMI will undoubtedly launch AHD (Audio High Density), the digital version of VHD, in due course. The fact that all existing VHD players will be able to play AHD (with a plug-in adapter) may well help to move more players. The digital analogue compatible laser player (in PAL) is still two years away. The track skipping facility, which JVC has developed for the arcade market, will also arrive in Europe The latter presents many complex problems in pre-mastering, particularly with the PAL eight-field colour sequence to be considered, but the Japanese ability to solve this kind of technical problem cannot be under rated. So VHD presents a choice to system specifiers, which, if they are prepared to understand and weigh-up the system differences and present them properly, will bring more people into the interactive camp more quickly. Promoting VHD may appear divisive, but it could make our industry bigger, more quickly, and make it more effective for our clients at a lower cost. None of this answers the question of whether VHD is "better" than laser technology or not. In the United Kingdom the general feeling amongst programme design companies is that VHD represents an alternative which has value at the low-cost end of the market to bring people into using interactive techniques and technology. There is also a feeling that VHD probably has the opportunity to carve out a sector for itself in the "horizontal" markets - i.e., those where its unique abilities offer new opportunities-rather than in the "vertical" markets indicated by the United States experience. Whether this shows the way forward to VHD in the United States is a question only JVC and its Japanese collaborators can tell. The story of VHD is a long and complex one, as is the history of the videodisc. The videodisc market is not about equipment, it is about messages; in today's jargon -the software and VHD is as good at delivering complex messages as any other disc system, and is much cheaper. Having discerned the truth of these two factors, it only needed confidence and commitment from THORN EMI to make the decision to launch inevitable. This they did in January 1984, aiming the system and their expertise at the industrial, commercial, and institutional market sectors. 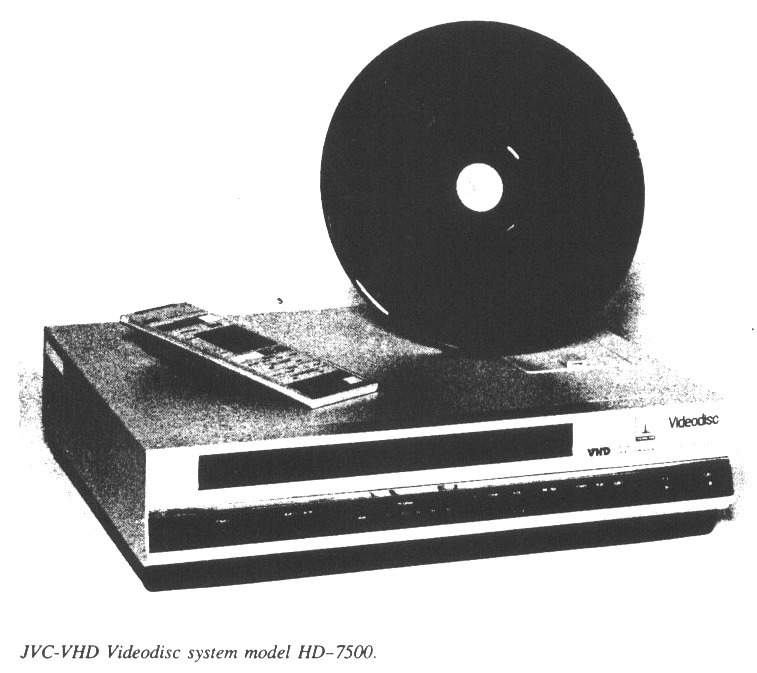 The VHD videodisc is 10.2 inches in diameter and uses a capacitance disc reading system. The disc is pressed in one piece in a manner not dissimilar to an audio LP. The material is specially formulated plastic with electro capacitance properties. Pressing the disc entails creating a spiral of pits in the surface of the disc. These pits are two parallel lines containing in one, the video and audio information, and in the other, the tracking information needed to keep the sensor in the right place. Each disc side can contain sixty minutes of programme material. There are two television frames per track (i.e., one pass of the circumference of the disc) thus, there are 45,000 such tracks per disc side. The number of pits pressed in a full disc side is about 10*10(10 to the power of 10) and the pit size is less than one micron and approximately 0.3 microns deep-too small to be seen without the aid of a powerful microscope. The mastering process takes a one-inch C-format videotape, made to specification and slightly tighter than broadcast. The tape is replayed to a laser cutter that reads the off-tape signals, generates, concentrates, and shapes the laser beam exposing the microscopic pits onto the surface of a specially photoresist coated glass master disc. This is developed to form the pits, which are then mirrored using an electroforming technique to produce a metal negative known as the Metal Master. Two further electroforming stages later, the Stamper from which the disc is actually pressed is created. This whole process can be completed in about fourteen hours although in practice the lead time on the disc is about ten working days. It is of course, very prone to contamination, and the THORN EMI Videodisc manufacturing plant at Swindon is rightly proud of its facilities and its achievements. In the mastering area, the clean environment is better than Class 100-that is fewer than 100 particles the size of a half micron and larger per cubic foot, and the standard throughout is not less than Class 10,000. Because the disc has a diameter of only 10.2 inches, the player is very small and compact, being no larger than most domestic VHS machines; and because it is front-loading it can be placed in racks, custom casing, etc. without taking up great amounts of space. It has a very low cost of £450 plus V.A.T. (Value Added Tax). The disc is read by a tiny diamond sensor held lightly on the surface of the disc. Down one side of the sensor is a thin metal electrode which senses small changes in capacitance. The sensor is attached to a carriage that travels across the disc which is revolving at a constant speed. As the distance of travel for random access is so short - barely 3.5 inches - the random access speed is very fast, worst case under five seconds. As every track has its own individual identity, random access is also track accurate. A unique feature of the VHD system is that it has a multi-standard capability. The disc turntable can switch automatically from the 750 revolutions per minute required by the PAL system, to the 900 revolutions per minute required by NTSC, thus a PAL display system can play NTSC discs providing the monitor/television is tolerant enough to handle the slightly strange PAL signal that emanates. Equally, an NTSC system can play PAL discs. The THORN EMI's 3DO1 player is based on the player that JVC and six other companies are marketing in Japan, both as a domestic player and as an industrial player. It does however have two further significant differences. First, there is an extensive range of programme facilities contained in ROM in the player itself. To take full advantage of these, codes have to be added to the programme material-more of that in a moment. Secondly, there is a connection socket for a computer interface, and THORN EMI offers an RS232C Serial interface box for £100 plus V.A.T. This small simple player provides a wide range of facilities, but it is the programme maker who has to exploit them. Interactivity applies to programmes, not technology. The technology provides the capability to make the programmes interactive. An interactive programme is one in which the viewer group is small - often only one person, and he or she has an incentive for viewing the material. An essential pre-requisite of viewing is that the viewer is taking part in determining the course of the programme. motion with synchronized sound (stereo or mono) or mute; maybe still pictures progressed in a sequence or alone, with or without audio; or maybe audio running behind pictures from another source. Text overlay from an external source, such as a computer, add a new dimension to this interactivity. the need for a computer when a basic level of inter-activity is required. 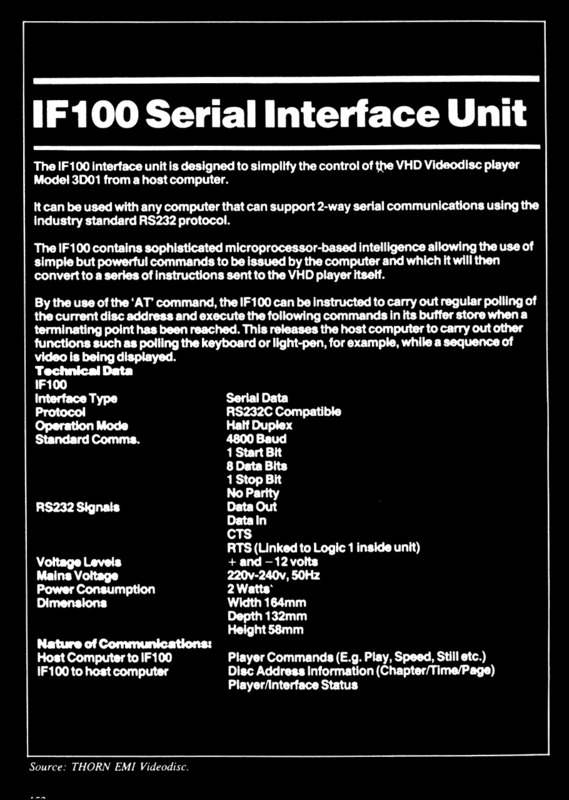 The interactivity on a standalone player (no external computer controls) relies on the ability to place VIT codes into the vertical interval of the television picture and the ability of the videodisc player to read these commands. The basic codes used define "chapters" (i.e., bands of varying duration), audio modes (allowing auto switching between stereo, mono, and dual) and "auto-stop". The latter codes cause the disc to stop and display one track until the viewer commands otherwise. Two other address modes are provided automatically on the VHD videodisc - elapsed time, and track numbering. Thus using chapter coded (2 digit), time (4 digit), and track (5 digit) the programme maker has a potential of 48,700 separate (though overlapping) addresses, and can create automatic stops on any of these. Despite the very clear advantages that the VHD system has in being able to provide low cost simple interactivity based on vertical interval command codes, there is little doubt that many interactive applications will be under computer control. Again, the price advantage of VHD is already beginning to show itself. The first major use of videodisc in jukeboxes is using the VHD system, and since its introduction in January 1983, VHD has attracted considerable attention from a wide range of organizations including British Telecom, Austin Rover, Manpower Services Commission, and a host of similar organizations. In commerce, in industry, in institutions - whatever the application - interactive video is only as good as its software. That is why THORN EMI is making available a comprehensive service the market can draw on, ranging from the development of the initial idea right through to the delivery of the system and beyond. Considerations of a videodisc system may involve major investment decisions by an organization. Careful planning of both the software and hardware requirements is necessary. THORN EMI Videodisc can provide a full consultancy and advisory service to translate these needs into decisions, and then actions. THORN EMI has the videodisc design experience. They are available to assist with the development of interactive programmes and to give guidance on this new conceptual approach; advice can be given on flowcharting and technical requirements. The THORN EMI Software Advisory Centre is available to work with in-house video or film units, and with production and facility companies, maintaining a close liaison with both creative and technical teams. The final stage of post-production for videodisc, usually known as pre-mastering, is one that fills many people with concern. Firstly, where within the geography of the videodisc should each element be placed? Secondly, how can you ensure that the control/command codes are recorded in the correct places? And thirdly, how can one be sure that the disc will work correctly once it is pressed? With the VHD system the answer to this problem is simple, because the whole of THORN EMI's videodisc effort is in one company-THORN EMI Videodisc. Within our group we have an associated video facility company and this enables the Software Advisory Centre to control the whole operation if required. The Advisory Centre is an essential and integral part of the company. THORN EMI's commitment is neither half-hearted nor opportunist, but a carefully calculated approach to develop a major new business in a growth industry - industrial and educational communications technology. The software understanding expertise of THORN EMI is available to the market as this is the key to the success of videodisc in the industrial, commercial, and educational market.